It was another balmy evening Friday as the Chautauqua Foundation Dinner commenced on the private backyard garden of the Miller Cottage on Miller Park. Celebrating the final stretch of the Promise Campaign, the event also acknowledged the Chautauqua Foundation’s recent acquisition of the Miller property, thanks to a generous donation by Tom Hagen. Traditionally held the Friday prior to the official start of the season, the night is an intimate gathering of pres- ent and former board members of the Foundation and Chautauqua Institution’s trustees, as well as 50 or so of the Promise Campaign’s volunteers and their spouses, thanking them for their years of support and dedi- cation. Cathy Bonner, chair of the Chautauqua Foundation Board of Directors, was first to speak and honor the Hagen family. In addition to donating funds for the purchase of the cottage, Hagen has also committed up to $150,000 to match — dollar for dollar — gifts made to its endowment. When Hagen stepped forward to speak, his voice traveled through the crowd in lacquered zest. 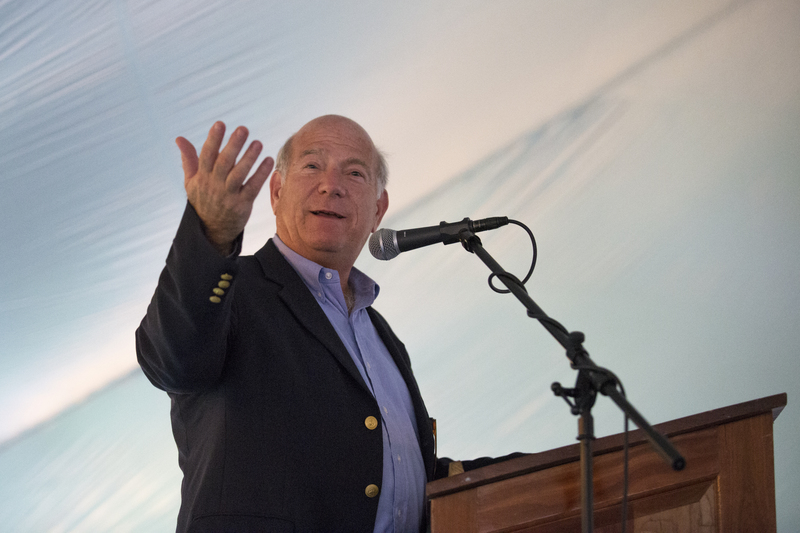 A board member of the Chautauqua Foundation, Andrew Camden, was quick to underscore Hagen’s thoughts on the Institution’s ownership and further applications, such as exposing visitors to the early history of Chautauqua. Members and volunteers of the Chautauqua Foundation dedicate their time diligently, carefully planning and calculating over a period of years. But they also have to be able to adapt. The Promise Campaign, which began in 2010, entered its public phase in fall 2013. But major projects such as the renovation of the Amphitheater, for example, had to take precedent over such projects as Bellinger Hall as time progressed. The Rev. Robert M. Franklin Jr., director of the De- partment of Religion, gave a blessing before the meal and spoke a few words from novelist Victor Hugo. “‘Dream no small dreams for they have no power to stir the hearts of humanity.’ All Chautauquans are dreamers, but these campaign volunteers dream only grand and bold dreams,” he said. Given that the Promise Campaign has achieved $96.1 million of its $98.2 million goal, it’s fair to say the Foundation realized its dream, answered the call and adjusted accordingly. “It’s not about the figure, but the impact the dollars will have,” said Steve Percy, co-chair of the Promise Campaign. The night also acted as kindling for what the summer season was soon to bear. Deborah Sunya Moore, vice president and director of programming, spoke of “the balance between tradition and innovation,” with emphasis on the newly appointed artistic and general and artistic director of the Chautauqua Opera Company, Steven Osgood. Osgood introduced members of the company, who then performed excerpts from their upcoming performances, such as La Traviata and The Mikado. President Tom Becker walked to the podium to end the night. Invoking the leitmotif of the season, “What Does It Mean To Be Human?” Becker spoke with a lyrical cadence.